This Triple Gear bushing is stuck on the Fly Wheel. Need suggestions for best way to get it off. Slice it partway through (don't nick the pin) with a Dremel tool cut off wheel, then finish splitting it off with a cold chisel and hammer. How about an acetylene torch flame to uniformly heat up the bushing without melting it? It should expand enough when warm so that it could be pried off from underneath or grabbed by a vise grip and twisted off. Just don't go for cherry red! I would also try even heat first with a water pump pliers to grab & twist - I've had to do both ! That problem may go back to a few years ago when the bushing material would expand when hot and then not contract again when cooled. I found that same problem on a Triple Gear this week. The engine had been run enough to enlarge the Triple Gear hole so the bushing would fall out. This is the other extreme that I found 10 years ago. 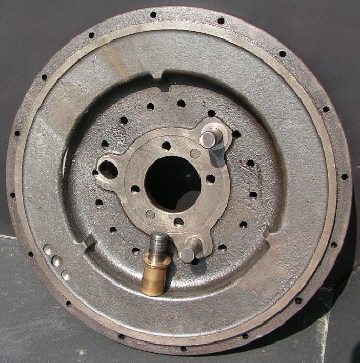 I would probably be replacing the pins anyway and they are a press fit out the back side so I would just take it to a press and push the pin down into the bushing and out the back of the flywheel. 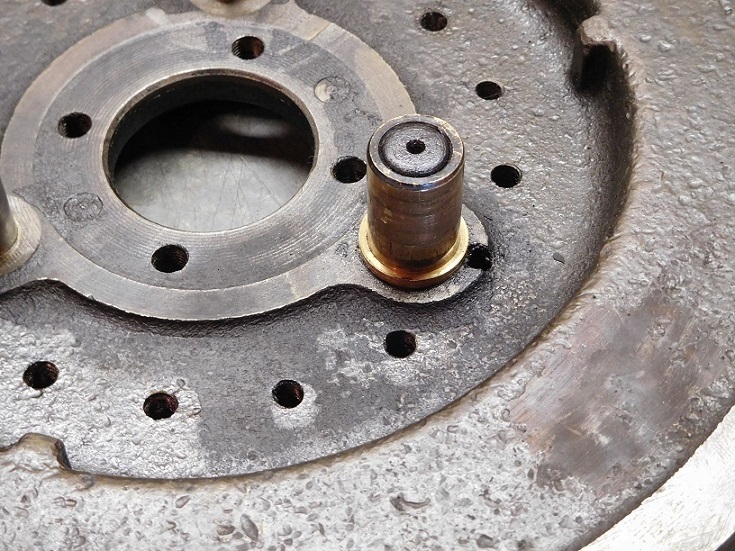 The part of the pin that is a press fit in the flywheel is larger than the part where the bushing is stuck so the pin should not damage the flywheel if you push it out the back side like you normally would to replace a pin. I'm with John. New pins and new bushes reamed to the correct running clearance needed. If you think the pins are serviceable, then destroy the bushing. Another way it get it off is, with help, support the pin on something like an anvil and peen it. It will come right off. Chances are if the busing spun in the triple gear, the hole would be oversized. I would suggest when replacing the gears with used ones, get a set that came out of the same engine so the wear patterns are the same on all three. Also, after the bushings are installed they need to be reamed and faced for correct clearance. Just add a little penetrating oil. Then grab it with a pair of water pump pliers and twist and pull at the same time. Wm. -- Measure the triple gear pins twice, 90 degrees apart. They wear on the inner and outer surfaces, not the "sides." If there is a difference of more than a couple of thousandths of an inch, they need to be replaced. Success !! I got the bushing off, mostly using the method suggested by James A Golden. Once I realized there is a spiral oil groove in the bushing the penetrating oil would go down the groove, eventually loosening the bushing. All of the responses were helpful, Thanks to everyone. My new bushings came to day.